It’s almost December and you still haven’t winterized your sprinkler system. If you are living in New Jersey this could mean bad news for you. After all, temperatures have been getting lower and lower every week, especially at night. 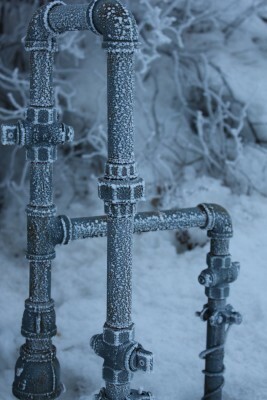 If you aren’t really sure what to expect now that colder weather is threatening to freeze your pipes, we thought we could give you a little more information regarding why sprinkler blowouts are so important and what may happen since you missed your opportunity to winterize your sprinklers. You may think that because your sprinkler pipes are underground that there is no way they will freeze, after all they are protected by a few feet of soil. Unfortunately this is not necessarily the case. When the weather reaches freezing, the frost level tends to infiltrate the soil deeper and deeper. In places like New Jersey where freezing temperatures tend to stick around for weeks at a time, it is likely that your soil will freeze as deep as 2 feet below the ground’s surface. Contrary to what you would like to hear, your sprinkler system likely resides between 8 and 12 inches below your lawn’s surface. When your pipes get cold enough they will begin to crack, as will the pipe fittings. The real trouble however, comes when the anti-siphon devices and valves begin to become structurally unsound. These are the most expensive parts of your sprinkler system and will be the most painful to replace in the spring when your new sprinkler system is being installed. Don’t beat yourself up about forgetting your sprinkler blowout this year. Although it is not ideal, you will always know the importance of taking this measure in the future and your sprinkler system as well as your yard will benefit from this lesson for years to come.